Hop aboard the sleigh and join Anna and Olaf as they visit to Queen Elsa’s beautiful ice palace! What will they do first? Play hide and seek behind the secret staircase, or go skating around the castle? They could ski down the ice hill or enjoy ice creams! It’s all up to you! First have fun building Elsa’s Sparkling Ice Castle. Then it’s time to play! Includes Queen Elsa and Princess Anna mini-doll figures, plus Olaf the snowman. Price is 33% above the initial Lego retail price! This comes down to 20.54 cent per brick. 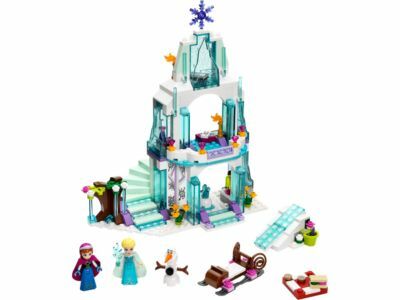 The Elsa’s Sparkling Ice Castle (41062) Lego set is no longer directly available from the sites below. However, 3rd party partners of these sites might still have the set available.